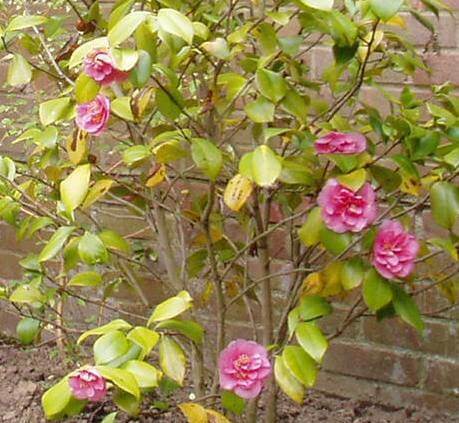 You are here: Home › Practical gardening › Why has my Camellia gone yellow? Why has my Camellia gone yellow? • Comments Off on Why has my Camellia gone yellow? Plants such as Rhododendron, Azalea, Camellia and Acers are often described as ‘ericaceous’, indicating that they thrive in an acid soil. In fact, it is more accurate to say that these plants do not thrive in an alkaline soil, they are perfectly happy in a neutral soil especially if iron is added. Here is the explanation: ericaceous plants cannot tolerate an excess of calcium and calcium is the main cause of an alkaline soil usually in the form of chalk or limestone. Calcium reacts chemically to tie up the iron present in the soil, making it unavailable to plant roots and iron is one of the micronutrients essential for plant growth. Certain families are especially susceptible to iron deficiency and this limits the formation of chlorophyll (chlorophyll gives the green colour and is vital for photosynthesis) so the leaves turn a sickly yellow colour with only the veins remaining dark green. This at least makes the problem easy to spot! It is the shortage of chlorophyll that causes the plant to struggle, not to grow and fail to flower. Happily the condition can be reversed by supplying a form of iron that does not react with the calcium and so remains in the soil accessible to the roots. It is usually labelled chelated or sequestered iron or iron sulphate. It is also sometimes referred to as ‘blueing powder’ because of the effect it has on mop-head Hydrangeas which flower blue on lime-free soils and pink otherwise. Adding well-rotted organic matter will also help prevent lime-induced chlorosis. Of course, it is far better to grow plants that thrive naturally in your particular garden soil than to fight nature: there are plenty of beautiful flowering shrubs for those of you with alkaline soils.